See all the critical financial trends at a glance and discover where you're earning and losing money. As soon as you log in to Costlocker, you’ll see a graph showing the current financial performance of your company in monthly segments. You can easily see how your business has been doing so far, but Costlocker also tells you more about the future – for example whether the upcoming invoices will cover the costs of the upcoming months. 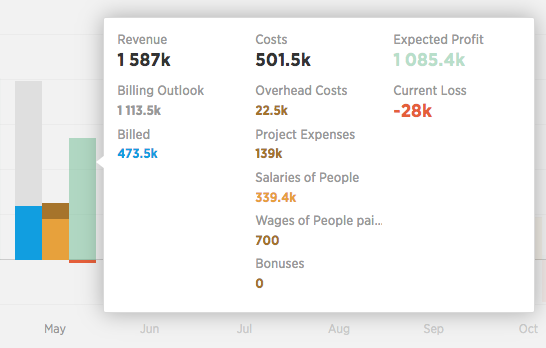 If you hover your mouse over the graph, basic information about your financial performance for that month will pop up. 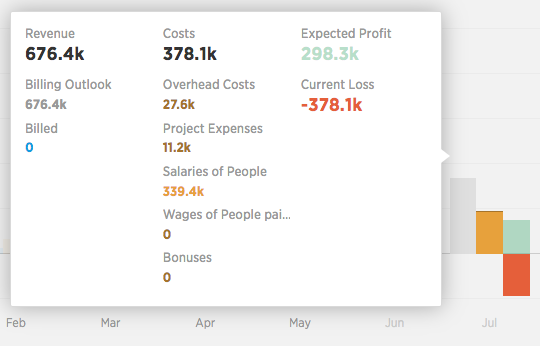 Clicking any month in the Company performance graph will reveal a detailed breakdown of the income and expenses for that month. Remaining billings – how much there is left to bill the current month – even if nobody has planned any billings yet, but some projects are scheduled to end (Estimated end date) and there’s still something left to be invoiced. The Company performance offers a look at the upcoming months, too. This enables you to see whether you’ve planned enough billing to cover your future expenses. This screen shows your financial performance in 2 months. It can be seen that there’s enough billing planned (grey column), so the income should cover the expenses (yellow and brown columns). That’s why the light green column shows a profit – under the condition that you really invoice everything as planned and that there will be no increase in estimated costs. If you look 5 months ahead, you’ll see the income from your fee-based projects. 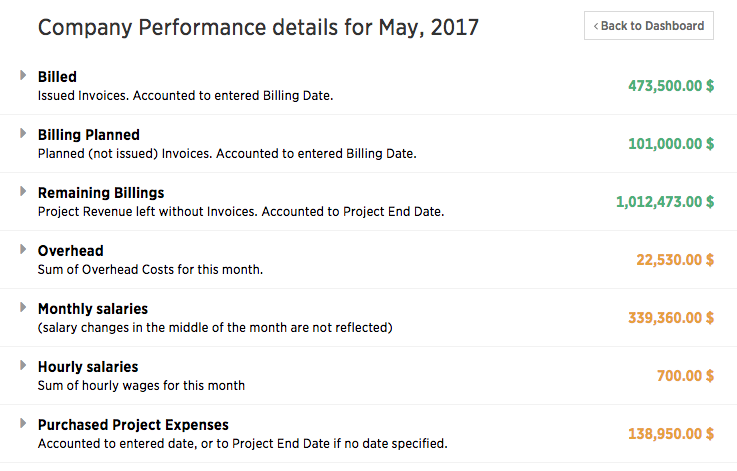 If there are expenses set up in your RECURRING projects as well, these will be shown too.